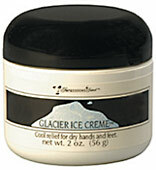 Glacier Ice Creme is specially formulated for dry hands and feet. Its unique blend of Collagen, Panthenol, and Azulene helps heal dry or cracked skin. Sweet birch refreshes tired feet while rich emollients protect skin from moisture loss. Recommendation: Use on hands and feet as needed to protect against dry skin including eczema. For extremely dry skin apply overnight and cover with socks or gloves.